The Tennis Section are very active in social tennis. 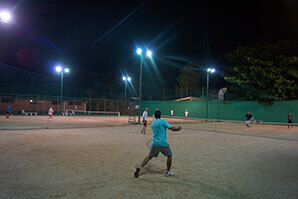 Every Tuesday and Thursday evenings, from 5:00 p.m. until 9:00 p.m. they reserve the courts for social tennis. This does not mean that other members cannot use the courts. Far from it. One just becomes part of the section, meets new friends and normally plays doubles, against nominated opposition. Everybody finds a welcome in the Tennis Section. Every now and then, the section organizes a tournament against another club, and this turns into a major social occasion complete with barbeque and drinks. Usually, tennis is played on a mixed double format, giving everybody a chance of a game or two. A professional coach is employed by the club and can be hired for lessons or advice. It is suggested though, that the court be booked for peak times such as late afternoons or early evenings on the weekends.